All welcome. Registration available below. A nominal fee of €10 to defray costs of coffee and lunch will apply. 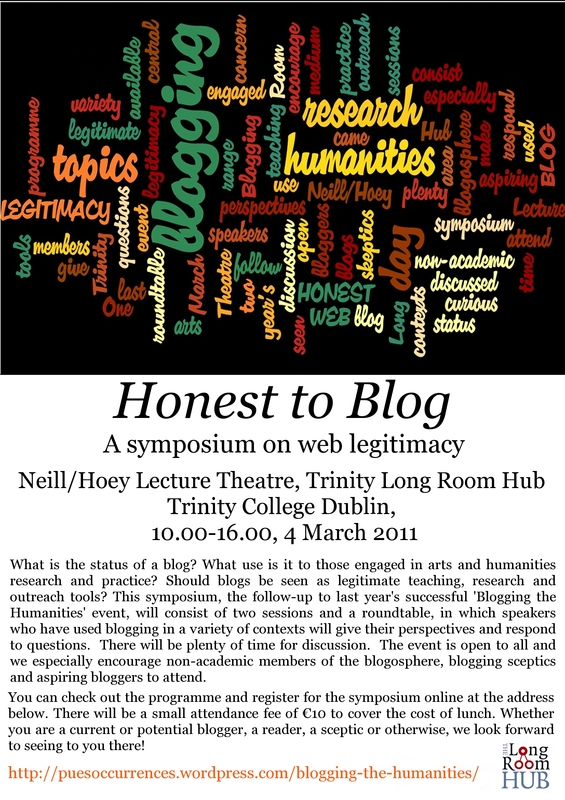 This symposium is a follow up to last year’s ‘Blogging the humanities’. One of the topics that came out of that day as a central area of concern was the legitimacy of blogging as a medium. What is the status of a blog? What use is it to those engaged in arts and humanities research and practice? Should blogs be seen as legitimate teaching, research and outreach tools? The day will consist of two sessions and a roundtable, in which speakers who have used blogging in a variety of contexts will give their perspectives and respond to questions. There will be plenty of time for discussion. The event is open to all and we especially encourage non-academic members of the blogosphere, blogging skeptics and aspiring bloggers to attend. If you didn’t make it to last June’s conference, and are curious about the range of topics discussed, the programme is available here. The final programme for this year’s symposium will be posted here soon. possibly a provider of. This implies that an online site cannot come with an article on Wikipedia mainly because it is the largest of the kind.